This idyllic 12 acre farm is located in the picturesque Tweed Region. The property is rectangular in shape descending from the northern boundary to an enchanting, private creek on the rear southern boundary. Natural rain forest hugged the steeper terrain near the creek. There was a small macadamia nut plantation, established some 30 years ago on the higher ground near the road. The trees had been largely neglected in recent years and were no longer productive. The uncollected nuts were a target for vermin, and the vermin was an attraction for snakes. 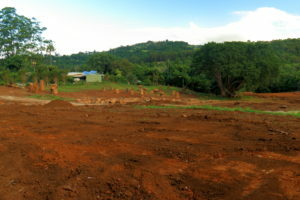 Therefore, an immediate project should be to remove the macadamia nut trees, and mulch near the timber for future plantings. 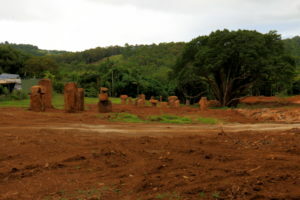 Once the macadamia trees were removed, a clearer context for the landscape was revealed. Mounding from excess soil as a result of ‘rock mining’ was apparent. A low boggy area was also revealed. The excess soil was spread to level out irregular areas and the boggy area was excavated to create a dam, for future livestock and for irrigation. It was during this process that the first of the rock columns was discovered. These rocks were formed during the eruption of Mt Warning and were flung out into the Tweed Caldera ad the surrounding hillsides. This discovery was very exciting and it was decided to incorporate the rocks as ‘standing stones’ in a paddock for livestock. It was determined to waterproof the dam using clay, rather than a liner, that can look unattractive when the water level drops. The house site was chosen, with rooms facing north/south, maximising the cross breezes; taking advantage of the northern sunlight for passive heating; and allowing for all rooms to face south to capture the view of the property. Bearing in mind permaculture design principals, landscape zones need to be set aside for vegetables and intensive production, bees, chooks, livestock, an orchard and bush tucker; and finally an area for a beautiful, ornamental garden.